Surprised to see Ford's hip new people mover on the list? Don't be. 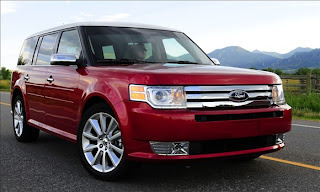 If the sea of crossovers out there isn't to your liking, it might be worth giving the 2010 Ford Flex the once-over. Aside from a more than capable 3.5-liter V6 engine with 262 horsepower and 248 lb-ft of torque, the Flex utilizes a seamless 6-speed automatic transmission and all-wheel drive to get you to the mall without the worry of being categorized by the masses. You can also opt for the new twin-turbocharged EcoBoost V6 with 355 horsepower, although that option will set you back nearly $7,000 over the all-wheel-drive Flex's price tag of $33,200. Throw in the ability to comfortably seat seven and this might be the sharpest way to go dashing through the snow in 2010.